Kotaku 'Shop Contest: Christie On Vacation, Winners! Last week I asked you to take Governor Chris Christie on vacation, and man does that guy get around. Pleasance13’s entry didn’t just take Christie to another beach or alternate universe, it took him inside a game that refused to release until it was something entirely different. 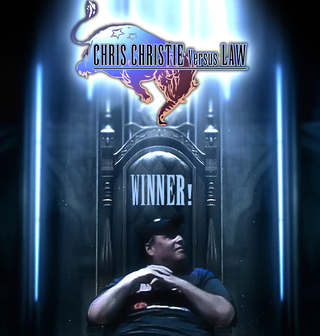 I’d be about as likely to play something called Chris Christie Versus Law as he is to get re-elected, but damn that’s some fine promotional art. Toad Duck gives us Far Christie 3. While BTKproductions delivers the Jersey governor into the most brutal fighting competition ever known. And amazingmao’s is a masterful and completely faithful recreation of Christie Kart. Many of the other entries, of which there were a friggin’ lot, have been gathered below for us to all point and laugh at as we continue to find our way through these particularly wild times. Trin had a caption for this but I lost it still I think it speaks for itself. TheRetroGamer takes the Governor to the Apocalypse. phimuskapsi finds an apt friend for him. We always need more Neon Evangalion. Thank you Jacbo Smit. Mrichston with a harrowing retcon of the MCU. TheRetroGamer gives us a peek inside Christie’s palace. Kokobware with some insight into his management style. Wraithen with an elaborate meta commentary on Christie as Trump possessed by Mario. Sorry my brain is fried, what’s this again Lintor? KBABZ is enjoying the Crash remaster, clearly. sciteach shows us where Christie went after getting rejected by the E Street Band. We see what you did here Ace Stanning. There were a lot of riffs on Planet of the Apes. Here’s BurnerSumner’s. Jace123 with the political deep cut. Also_Ran holds up a mirror to 2017. Ssmoomix catches Christie sun bathing in one of Trenton’s luxurious high rises. Please don’t take us back there Krizak757. vegeta0905 show’s us Christie vision when on acid. Arayne is a master of the blur. Bad news. Leo De’Artiste has some leaked screens from Kingdom Hearts III and it’s worse than you thought. handcuffedlightning broke me with this one. Miss you spot! Josh has convinced me. The Moon landing was definitely faked. No words for this one Alexander Crouton-Skitch. Marzombra had the best of the giant lizard bunch. 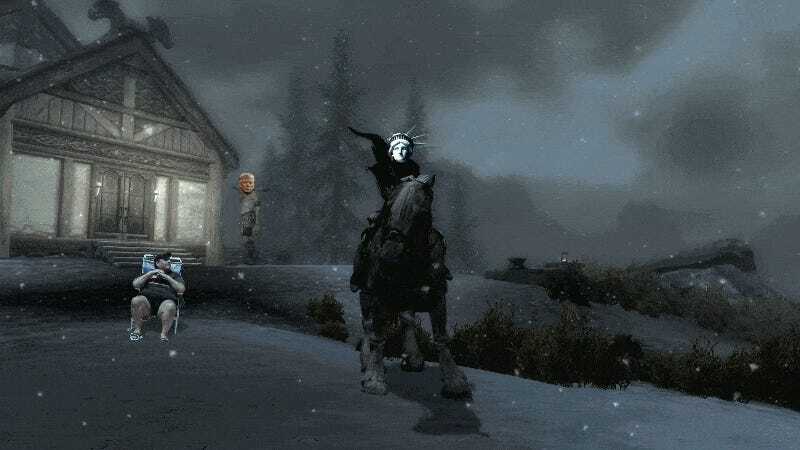 stonecreek knows that Christie is safe cause T-Rex’s can only see you when you move. BTKproductions had a bunch of good ones. This was another. JustBeingOtaku helps Christie’s dreams come true. highsierra with an exclusive on some of the alternate Time covers that didn’t make the cut. Green Monkie is still pissed about the last government shutdown. Guessing you can figure out what ColdCrow’s caption was for this one. Clayton W with another decent entry. Urambo Tauro hit one of my softspots. The Nothing goes back to the Jabba trough. Falconslab just took things to a dark place. Rayman757 takes us to an even darker place. Skarecrow13 ruins a perfectly lovely picnic. LinkToFuture asks us to consider the whale in the shark’s tank. k2b. nevertheless persisting in fuxxorin’ da man has a long name and a great gif.